Demand for energy in China has begun to really surge. For November, electricity demand is up nearly 28% over last year. Not following China energy demands in the past its difficult to tell the importance of the Year over Year (YOY) versus the month over month numbers or even compared to August. China's land mass is vaguely on par with the same distance from the equator as US so if on can assume the same temperatures then this is a powerful number. August is a high air conditioner month and November is typically cool, but not cold enough for massive heat needs. Even assuming that the world stood still for a while in November, the massive 28% increase is amazing. China appears to be kicking its growth engine into full speed. If the US ever gets back to demanding higher amounts of coal, copper, oil and other commodities, prices could soar. Everybody seems to forget that the last surge in commodities happened while the US had declining demand for copper and to a lessor extend coal and oil. The dynamic could change to where the US is bidding against China for that extra ton of coal or pound of copper. 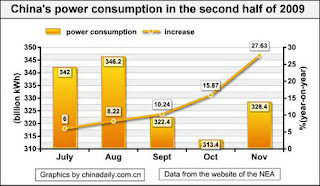 China's power consumption in November rose 27.63 percent year-on-year to 328.39 billion kilowatt-hours (kWh), up for the sixth consecutive month since June, China's National Energy Administration (NEA) announced Monday. The growth is 11.76 percentage points higher than the October level, which was 5.63 percentage points higher than that in September, said a statement on the NEA website. November consumption was 4.77 percent up from October. Total power consumption from January to November was 3.299 trillion kWh, up 4.77 percent from the corresponding period last year. China's industrial sector used 2.44 trillion kWh during the period, up 2.62 percent, according to NEA statistics.